RAY Morgan, Woking Borough Council Chief Executive Officer, has called on businesses to “seize the opportunities around you” in the local regeneration plans that he outlined at the Woking Chamber of Commerce AGM. 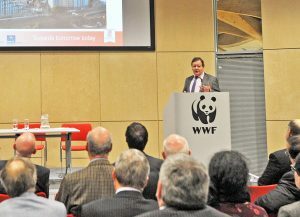 Mr Morgan, who was guest speaker at the event last week at the WWF-UK head office in Woking, gave an insight into plans for the development of the town centre that would lead to the town’s current tallest building being dwarfed by the proposed high risers. He explained that to enable the town to develop without encroaching on surrounding environment it was necessary to build upwards and he looked forward to the day when Woking’s development would be clearly visible from The Shard in London.